So three of the lectures to be streamed today and tomorrow at the National Archives’ Virtual Fair focus on immigration and naturalization. 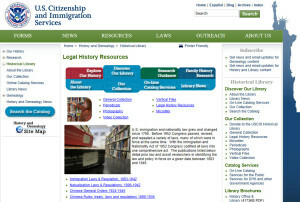 Today at noon Eastern time, Elizabeth Burnes of the National Archives at Kansas City, Missouri, will be presenting Alien Files (A-Files); today at 3 p.m. Zack Wilske of the U.S. Immigration & Citizenship Services (USCIS) will be presenting Citizenship Matters: Bureau of Naturalization Files at the National Archives; and tomorrow at 4 p.m. Susan Karren of the National Archives at Washington D.C. will be presenting Oh, The Stories They Tell: Chinese Exclusion Acts Case Files at the National Archives. So how do we find out what the law was in the area of immigration and naturalization anyway? Here’s where to go, and what you’ll find. First off, you head over to the USCIS website — http://www.uscis.gov — and look at the menu on the left hand side of the page. It has a heading I Want To and then subheadings like Find, Services and USCIS Social Media. The one you want is under Services. It’s the subheading for History and Genealogy. 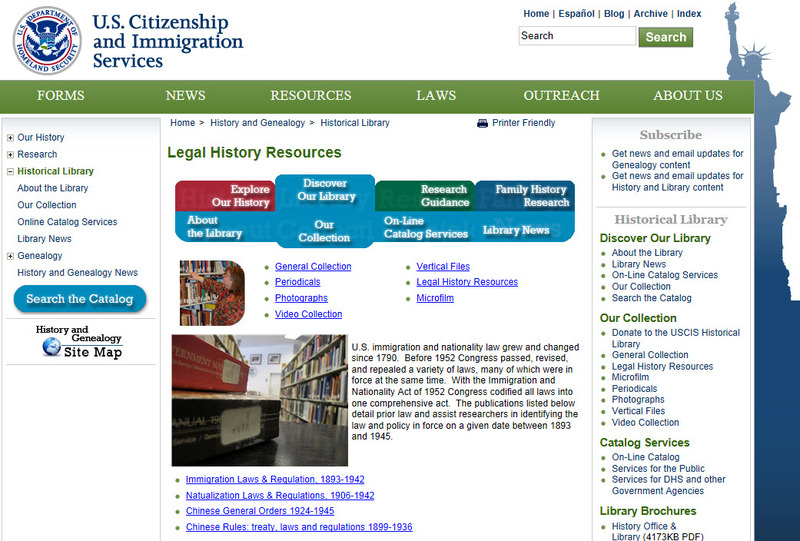 Click on that link, and it takes you to the page of the USCIS Genealogy Program. Now this is a page you want to know for all kinds of reasons. It’s the entry point to an array of genealogical goodies for those of us with immigrant ancestors. So bookmark that to come back to, and stay with me. On that page, we want to head to the Historical Library, either from the menu at the left or under the tab in the center labeled Discover Our Library. This again is a page you want to bookmark to come back to: there are photographs, even videos and lots of other goodies here. But stay with me again and, under the Our Collection group in the middle, click on the link for Legal History Resources. And voila! The promised good start. Now these are not individual documents. Clicking on each link runs a search in the Historical Library to bring up resources falling in those categories. The first link, for example, brings up 27 documents ranging from Immigration laws and regulations as of March 1, 1893 to Immigration and nationality laws and regulations as of January 1, 1942. The second link brings up 23 documents ranging from Naturalization laws and regulations of October, 1906, to Naturalization laws and regulations, January 1, 1942. By going through them, you can see how things changed for our grandparents and great grandparents as they struggled through one of the most turbulent times in our history for immigrants. It’s not every law, or regulation, of course. Just a good start. And a great resource to help us understand some of what we may hear today at the Virtual Fair! Thank YOU, Marian, for all you and USCIS do for the genealogical community!